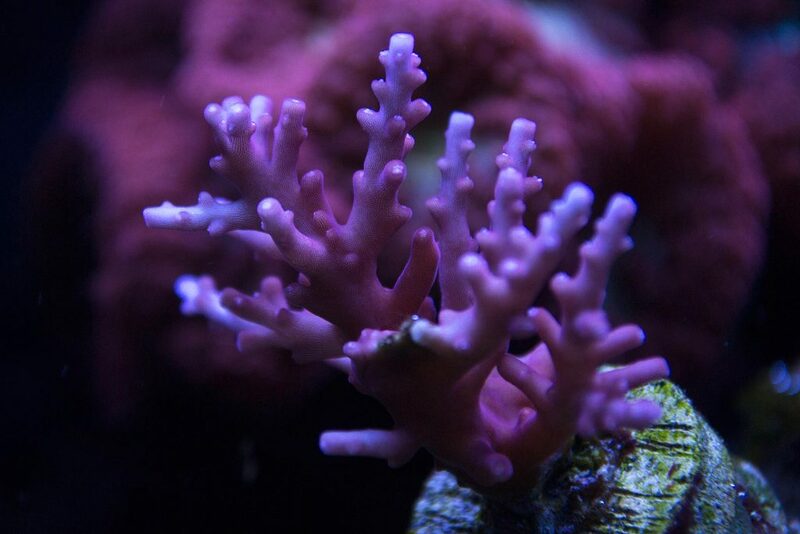 I have always had issues with red acros in this tank, I think a combination of poor stock and high/fluctuating phosphates. Things are improving here as well, but slower. Red Robin is still mostly brown. 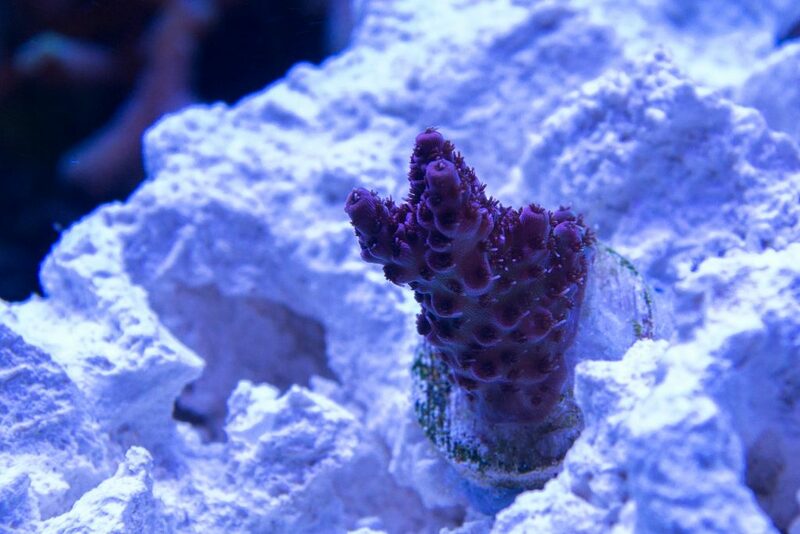 My 2 month old Red Dragon frag has been doing well and growing. Doesn't want to encrust though. This milli was my test at the beginning of the year. When purchased it was bright pink and then browned a few days later and stayed brown until last month. I think it's almost back to where it was when I got it and finally starting to branch out. My SSC is still a pain in the rear. 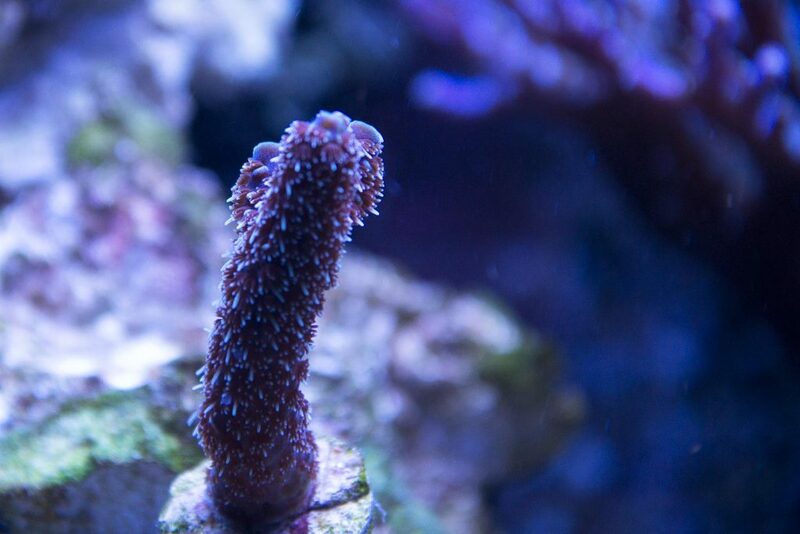 It was surrounded by clove polyps so I cleared the area and it has expanded and maybe is deciding to branch, finally, after 2 years. It's been through hell and back and not once has it even receded. It's also extremely effective at knocking the crap out of that Mystic Sunset weedy monti. 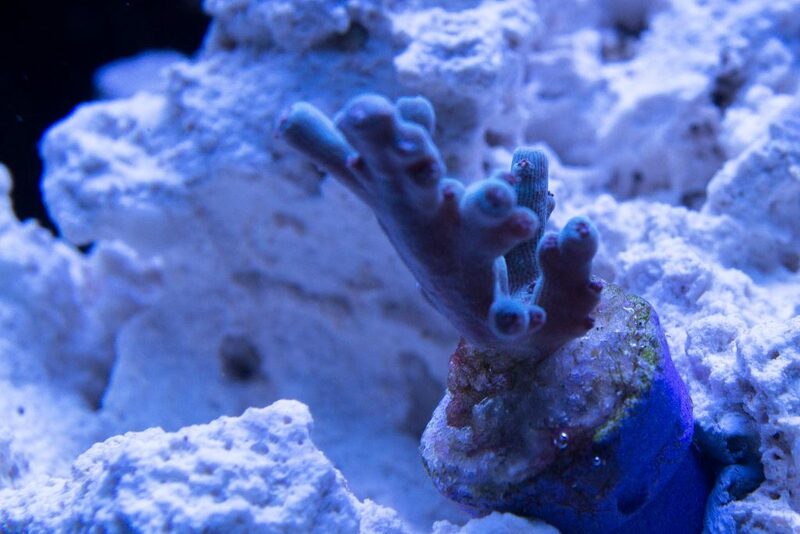 I have a really bad habit of picking up unknown frags and seeing what happens. This milli wants to be something, hopefully not green. 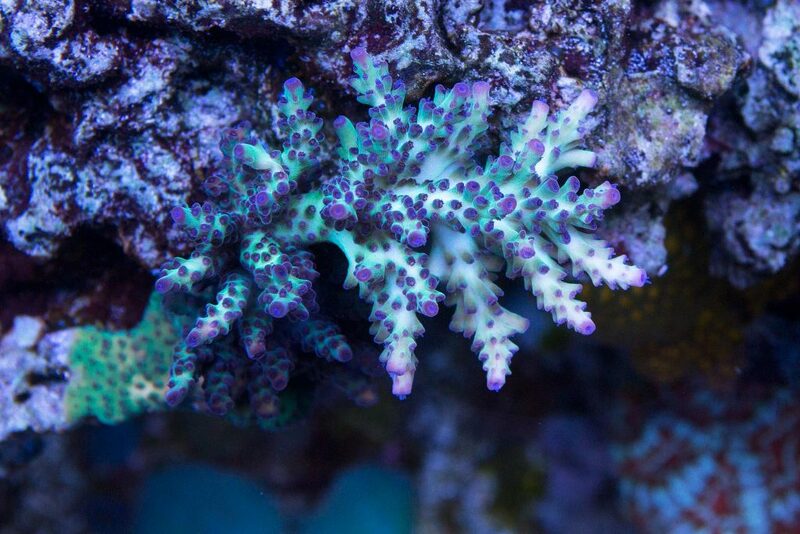 Finally, a testament to how rugged some of these acros can be if you just give them good and stable water quality. This was a fist sized colony when I had the alk spike that killed it back to a fingernail sized chunk. 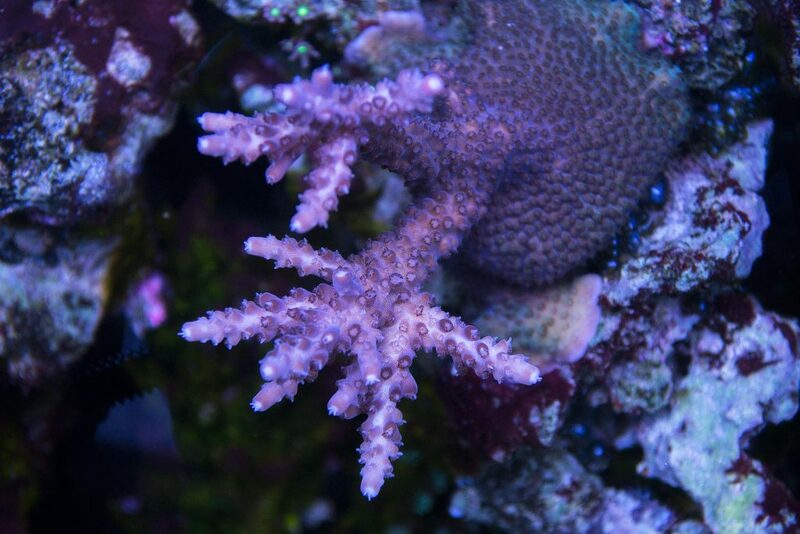 My goal here is to color up these acros and grow them out until my early mistakes become too much to tolerate. 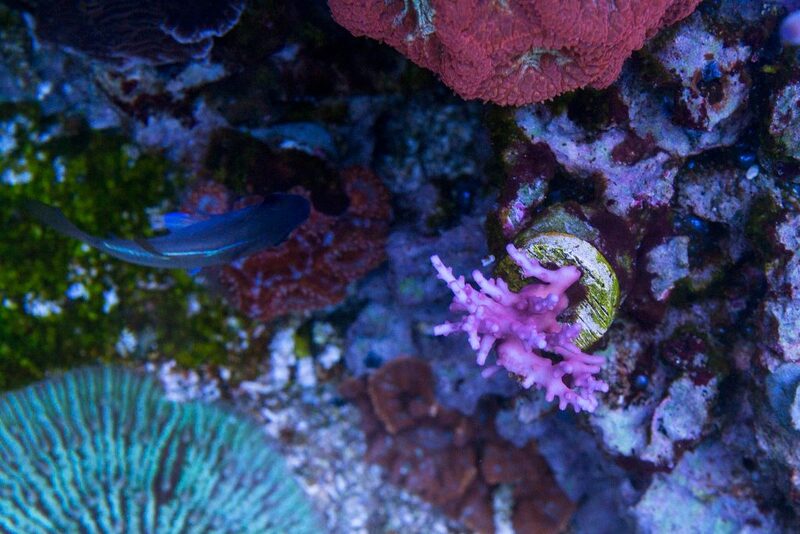 The Seafoam pally's, the blue cloves, and the general poor condition of all my rock, much of it from my first tapwater reef tank 3 years ago. At some point I'll move it all to tubs and start over in the same tank, this time without the pests. Wow Mark, everything is looking really colorful, glad to see things are going well! Thanks Perry! But the Red Robin is still brown. Wow there are some stunning colours in there Mark!! Your tank is amazing too, it's come along amazingly since the start! Thanks, still a work in progress for sure. I think you should move back here to the SPS forum now Mark so we can all find it much easier to keep track of what you're up to. I know you think you have this whole 'lone wolf' SPS keeper thing going on over there in the reef forum but how about you just admit you're as nutso about SPS as the rest of us and play here. Thanks Andrew, so far so good. Looks good Mark. I love the red robin stag. I see color coming through. As for it being a work in progress..... I'm sure all of us on here feel exactly the same. But that's part of why we we all love it. My only news is that I added another 200ml regular bio-pellets so now I'm 50/50 all-in-one and standard. I raised nitrates to 10, 2 days ago and it's been slowly dropping by about .5 a day, maybe. I just want to make sure I don't drop it too far too fast. Colors are improving, my SSC has green all around the base under blue light now, which for me is some kind of miracle. KH hanging steady between 7.9 and 8.1. I think things are looking really good. You have good color and excellent PE. 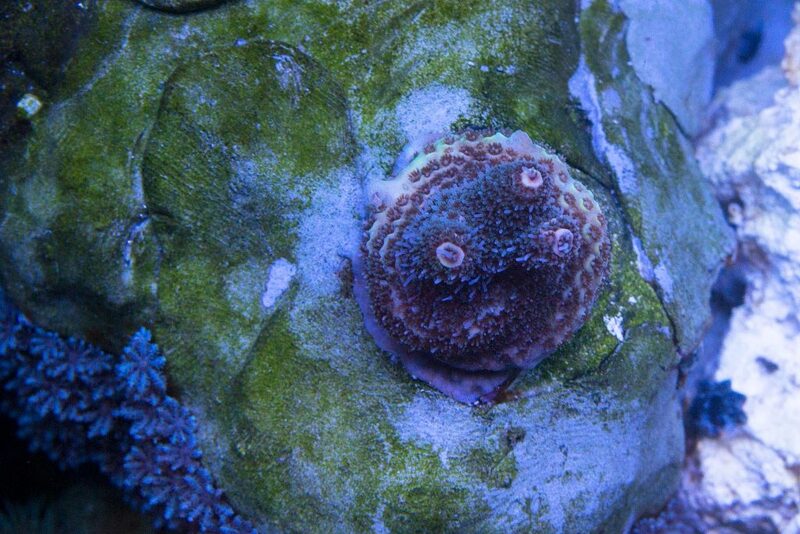 I've always wanted a Red Robin frag for my tank. Yours is coming along nicely. 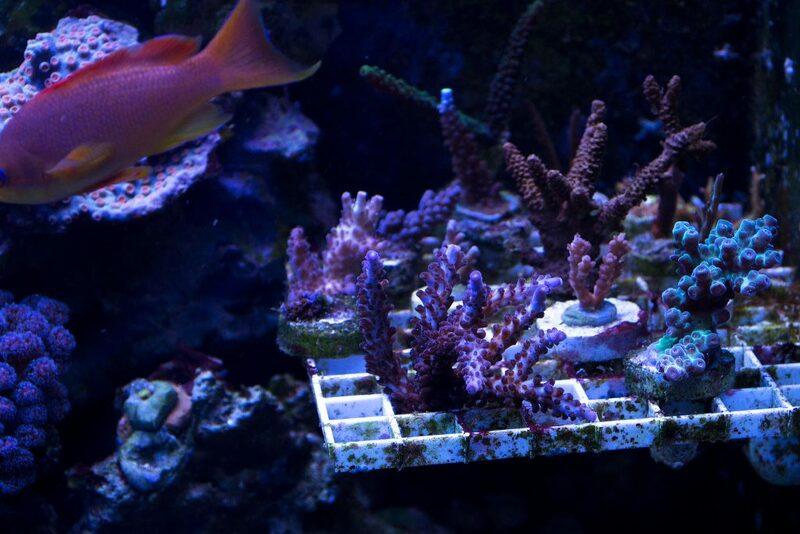 I agree, your colour and coral health looks great... that SSC is going to be a stunner when it takes off! I love this one! Stunning! Things are looking up, you're doing a good job coloring everything back up. Welcome back to the SPS forums! another week goes by and my reds still stink. I have reduced the white LED's on my BML strips to just 20% on the front to help simulate sunrise, blues still at 100% in front and 75% in back. 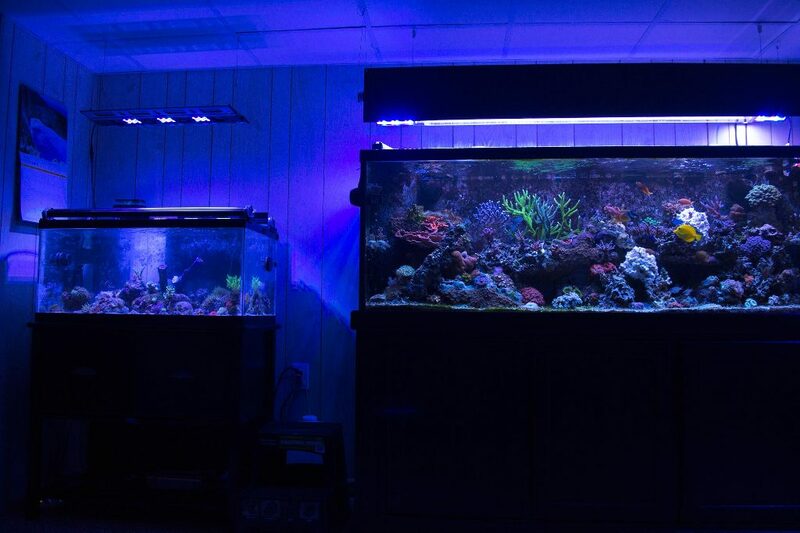 I adjusted the T5 fixture down a little to maintain ~400 PAR at the base of the highest acros. Blue LED ramps up starting at 11AM and off at 10PM. Blues, greens, and the pik milli have improved since I reduced the light cycle. Here is the pink milli. You can see the pink, but it's not very bright. The new growth should help, I hope. Tiny Red Dragon is growing at a steady rate. I'm getting another Red Planet this week, so far I'm 0 for 2 but I do think it was GFO and PO4 swings that killed it so I should have better luck this time. 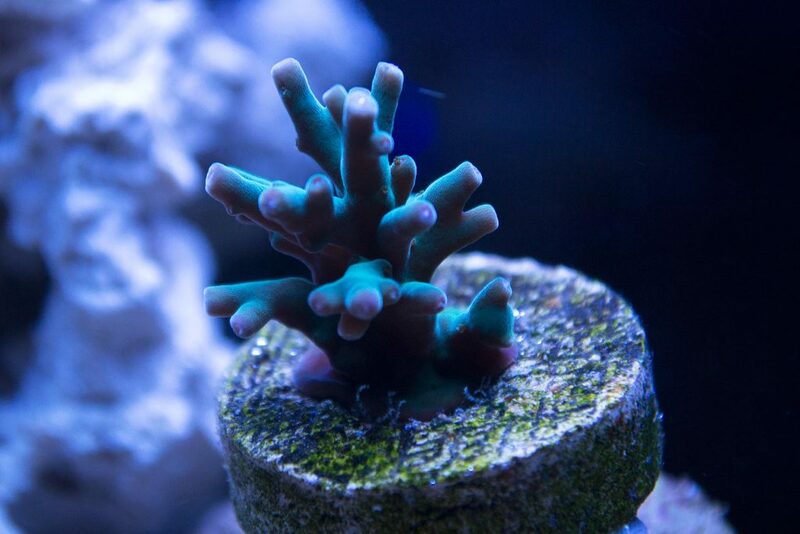 I haven't killed an acro since getting rid of GFO and switching to bio-pellets with nitrate dosing to help keep PO4 low. My biopellets are frustrating me. They can hold nitrates steady and every so slowly drop them but that's it and I've gone back to helping them out using RedSea NOPOX. I let the biopellet reactor ingest the NOPOX this time so maybe that will move things along, and I also lowered output flow thinking maybe I was moving too much water too fast through the reactor. FTS. Note brown red robin to the left of the blue stag. How good would this look if all three stags were at full color? If you are having trouble keeping po4 down with the biopellets I would recommend checking out All in one biopellets. There designed to drop nitrates AND PHOSPHATES. Normal bio pellets are not the best when it comes to lowering po4. You will not need to run anything additional with the all in one bio pellets to drop po4. Thanks for the tip! I guess I neglected to mention it in this thread. I am using all-in-one but have since decided I prefer nitrate dosing to hold PO4 down rather than the allinone. I've got a background source of PO4, probably in old rocks, that is apparently too much for allinone to handle. With nitrate dosing and using NOPOX I was able to slowly, and gently, bring down PO4 to around .03 (Hanna ULR, Elos pro PO4 kit). Right now I'm running 500ml allinone and 500ml regular bio pellets but they need to kick in so I can stop dosing NOPOX. It is really making me doubt my decision to go biopellets rather than carbon dosing, but I am sticking with it for a while longer to see if I can get it to work. The key, for me, is that since stopping GFO usage everything has been healthier, even if I'm still having coloration issues. Thanks Dom, much appreciated. I need that fire engine smooth skin you have, to see if I could turn that brown as well. New stuff. 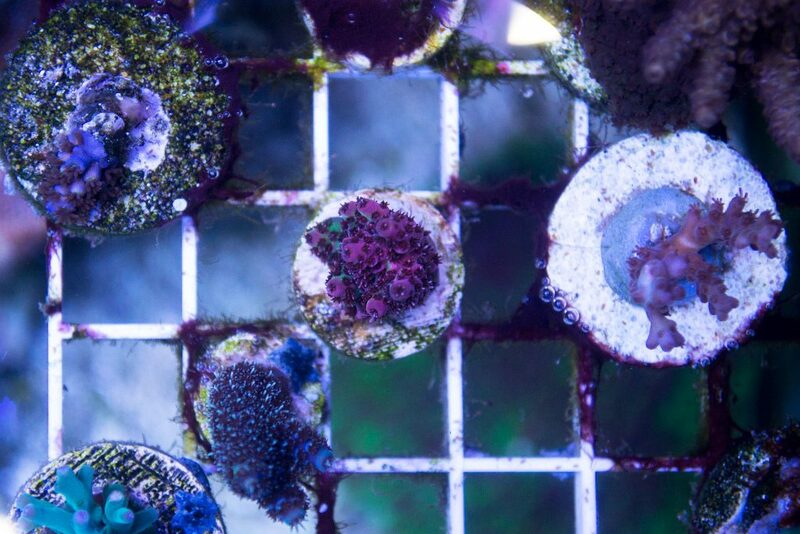 Trying to only buy known 'named' frags or frags from colonies in captivity for a while. New frags before mounting. These were all grown under 20K Radiums. Red Planet attempt #3, in the middle, Palmer blue milli below and left. Hawkins echinata, the milli, and a light blue caroliniana. 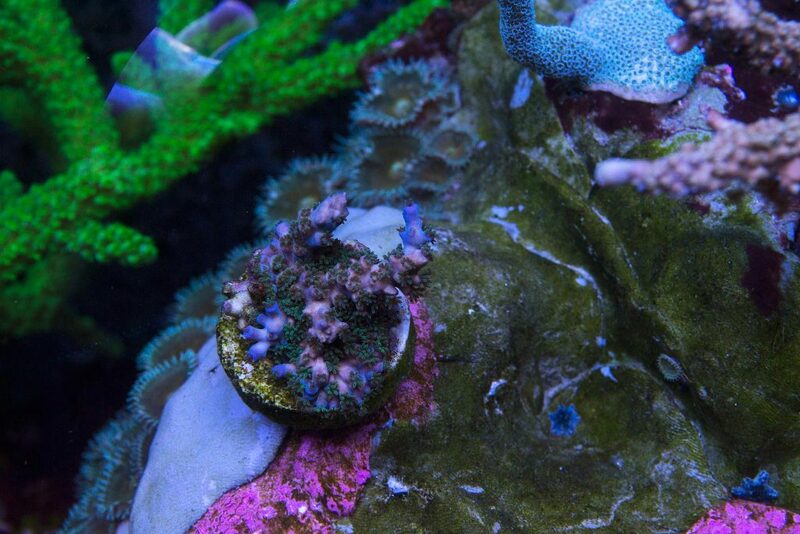 I try and mount each acro on it's own rock in case it needs to be removed, dipped, etc) for some reason. I've moved more LPS into the sand bed ready to make the trip over to my 40B. I'm not 100% happy with the scape and I purchased some branch rocks to see if I can come up with something more open. Need to wear sunglasses due to the new white rocks. Naturally I had to break something while rescaping. Very nice new additions. Love the Palmers blue millie. It is interesting to find out how they perform under the new T5 environment. 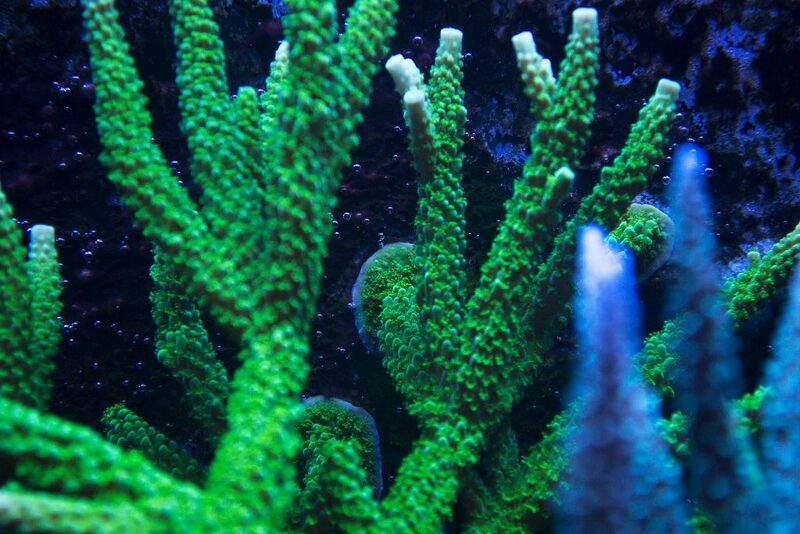 The colors you're pulling on your acros is stunning Mark. The one josh quoted just blows my mind mate, i would be all over a frag of that if i lived in lala land too. 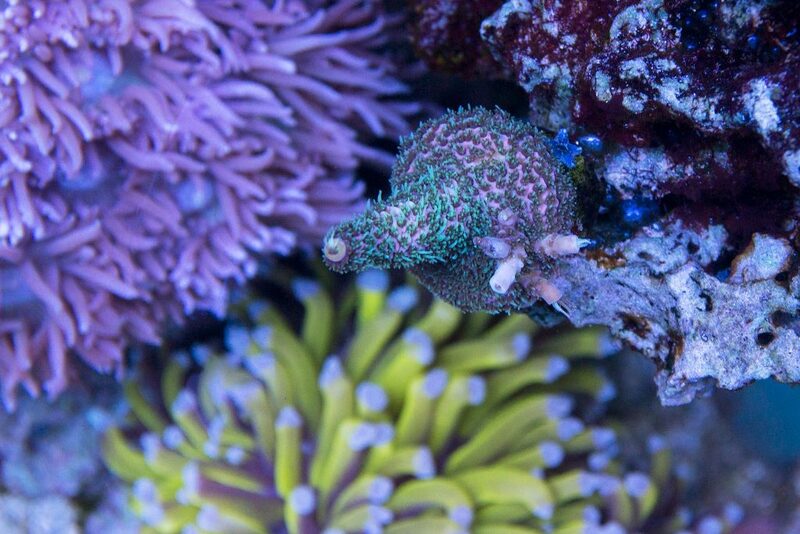 Those recent frags have Radium stamped all over their saturated pigments, judging by your other acros i don't think you'll have any probs at all holding those colors buddy - look forward to watching them grow. 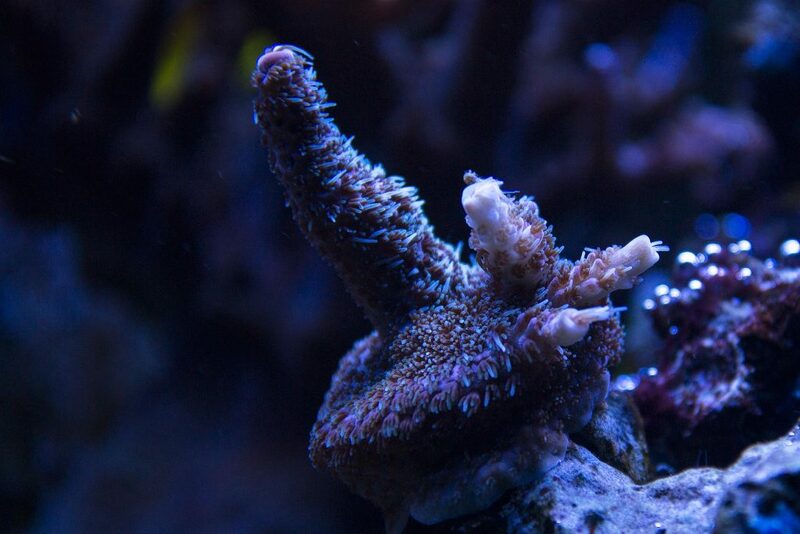 I finished setting up my 40B again, tearing down my little 20 ... but no, damn anemone starts to walk, so now he's by himself in the 29 until I can sell him. It's all LED with Maxspect Razor for the main light and BML 20K in back, aimed forward and a custom BML strip with less cool white in the front, aimed back. 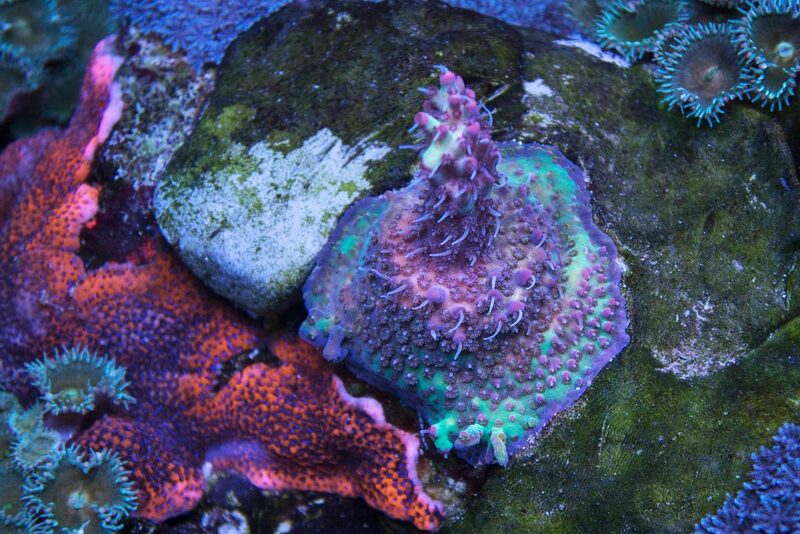 I've moved a few acro frags over and plan to move a few more so I can compare how they color up under the different lighting. Of course the chemistry won't be identical so this is far from a perfect test, but I'm still curious. This was also the first time I dosed Phosphorus (Seachem) and Nitrate when starting up a tank, which seemed to help everything acclimate very quickly. So enough of that. In the big tank, the slimer is telling me it does not want to be moved. It's extremely bright green during the daylight cycle but it's becoming yellow under blue lights, which is a first. Not sure what is up with that.